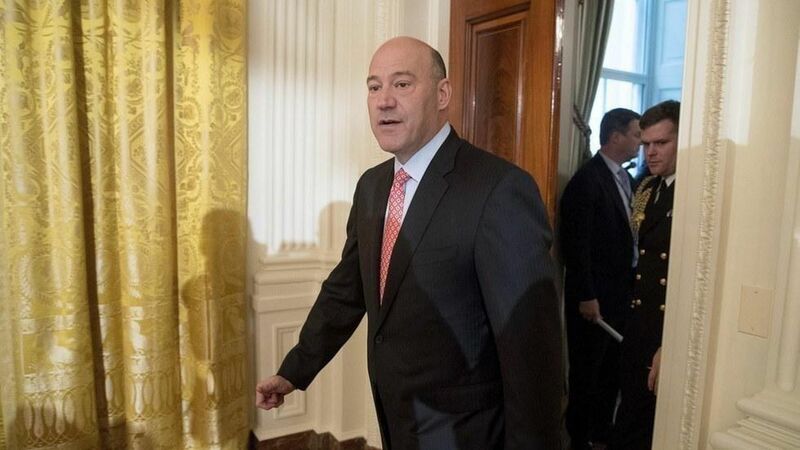 The Trump Administration has no plans to pay for its proposed tax cuts, according to revealing comments made Thursday by top White House officials Gary Cohn and Steve Mnuchin at an Institute of International Finance conference. There will be no border adjustment tax — the trillion-dollar hike on imports raised in Paul Ryan's plan — nor any other big new revenue generators. Both Cohn and Mnuchin said economic growth would be the primary way to pay for corporate and individual tax cuts, while fewer deductions and tax simplification would also play roles. It is not an opinion that is widely shared by on Capitol Hill, including among Republicans. "These are huge numbers," said Treasury Secretary Mnuchin. "You could have as high as $2 trillion difference in revenues over a 10 year period depending on what you think is going to be the growth function. The plan will pay for itself with growth." Trump economic advisor Cohn was slightly more cautious, saying that "running a big deficit in the tax code would potentially make it not permanent." But, like Mnuchin, he emphasized the importance of dynamic scoring (i.e., aggressive growth assumptions based on Trump's economic policies). Not all Republicans are warming to what some describe dismissively as a "magical" supply-sider approach. After Mnuchin's speech, a Republican intimately involved in tax reform emailed Axios: "Believing in $2 trillion in dynamic scoring is the legislative equivalent of believing in the tooth fairy. Aside from blowing a hole through the deficit, it does not provide the certainty that U.S. businesses need to make long-term investment decisions. That is one of the stated goals for tax reform."